Looking for the best free alternatives to Google Keyword Planner tool? Use these top 20 best Google keyword planner alternatives for keyword research free. As you are reading this Google keyword planner alternatives tutorial, we can assume that you are interested in knowing how to use Google keyword planner without creating an Ad or what is the best keyword tool free alternative to Google keyword planner. Well, if you want to get your contents listed on the top search engines, you need to rank them. There are a lot of factors responsible for ranking content on the search engines and one of the most valuable factors is keywords. In the context of search engine optimization, a keyword is a particular word or phrase that describes the contents of a Web page. Keywords are intended to act as shortcuts that sum up an entire page. Keywords form part of a Web page’s metadata and help search engines match a page to with an appropriate search query. If you are using specific keywords which are searched the most on popular search engines, there is a possibility that your content will be ranked well on all the best search engines available on the Internet. In order to find profitable keywords (relevant keywords, high CPC keywords, long tail keywords, high search volume but low competition keywords etc. ), you will have to do some keyword research. There are countless free keyword analysis tools available online which can be used to do keyword research and discover most profitable keywords‎ of your need. And once you are with a set of highly searched keywords, you are all set to use them in your content. As there are a lot of keyword suggestion tools available on the internet, so it might be a really difficult situation for anyone who wants to select the best and perfect keyword analysis tool to do keyword research for SEO (search engine optimization). However, one of the best and most popular tools which you can use to research keywords is Google Keyword Planner. Basically, Keyword Planner is a free AdWords tool by Google which helps you to search for keyword and ad group ideas, see how a list of keywords might perform and much more. Using this keyword suggestion tool and AdWords traffic estimator tool by the Google, you can search keywords for any topic and also find the keywords for your AdWords campaign. Almost all the people love using Google Keyword Planner tool but there are also some people who want a multifunctional keyword suggestion tool with premium features. Specially from the past few weeks, the majority of people have started looking for some best Google keyword Planner alternatives more passionately because Google has shut down free access to keyword planner tool and restricting keyword planner data for non-advertisers. But don’t worry, there are many Google Keyword Planner alternatives available on the internet and today we are going to share the list of top 20 best Google keyword planner alternatives for keyword research. But before we share the complete list of paid and free alternatives to Google keyword planner, let’s find out – What is Keyword research? What is Google Keyword Planner and how does it work? Keyword Research means finding keywords which are having the maximum monthly search volume. For the example “Best smartphones under Rs 10,000“ or “free WordPress plugins“ are some of the keywords which you can add in your article. The reason that you need to do keyword research is so that you can get maximum traffic on your website and there is low competition. Going deep on keyword research will help you in finding relevant keywords and will drive appropriate traffic which you are aiming. This will lead to more revenue generation and more traffic. With the help of some best keyword research tools, you can also spy your competitors and find out the profitable keywords which are being used by them. Once you have all the keywords which are being used by your competitor, you can rank them for your website and outrank your competitor. We hope now you know exactly what keyword research is. So now let’s find out – what is Google Keyword Planner? and What are some of the best keyword research tools available out there to do keyword research and analysis for search engine optimization? To access Google keyword planner tool, you need to have a Google Adwords account. If you are not having one, you can sign up for a free AdWords account. There is an option to use the already existing Google AdWords coupons and then you can start using Google Keyword Planner. If you want to target the AdWords advertisers, you need to use Google Keyword Planner. But along with that, the Google keyword tool will also help you in finding the right keywords for the articles which you are planning to publish on your blog or website. It’s also important to keep in your mind that while Google Keyword Planner can provide some great keyword ideas and traffic forecasts, campaign performance depends on a variety of factors such as your bid, budget, product, and customer behavior etc. Do you want to know more about the Google AdWords Keyword Planner tool or the use of Keyword Planner for keyword research? Check out this AdWords Help Center guide. Google keyword planner alternatives, free alternative to Google keyword planner, and keyword research tools like Google AdWords keyword planner etc are some of the widely searched terms over the internet, and that’s the main reason for us to bringing out this Google Keyword Tool guide. If you are also one of all those peoples who was using Google keyword planner tool for keyword analysis from a very long time but they are really pissed off right now with the big change to Google AdWords keyword planner (This page shows ranges for search volumes. For a more detailed view, set up and run a campaign) then trying some helpful Google keyword planner alternatives or free keyword analysis tools are the most appropriate solution for you. There are plenty of best alternatives to Google Keyword Planner tool and we have listed both paid Google keyword planner alternatives and free alternative to Google AdWords keyword tool too. Here we go. UberSuggest is one of the most widely used free keyword research tools which will help you in getting keyword ideas. The tool will generate long tail keywords as per the phrase or word which you have used. In order to generate new keywords, you can add number or letters after that particular keyword. 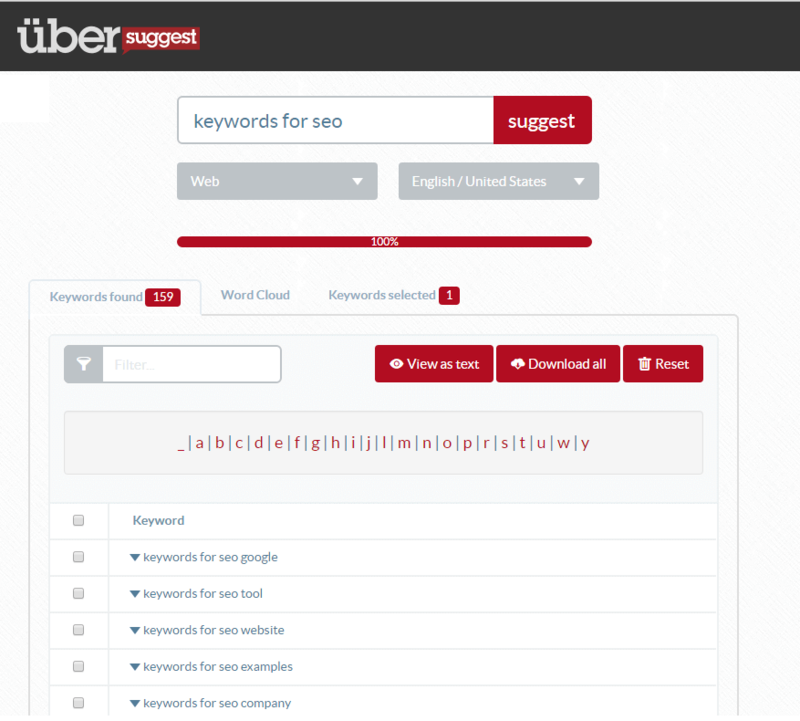 If you are not having a lot of keyword ideas then we suggest you to try out UberSuggest. Use this user-friendly keyword tool and get tons of keyword ideas for free. If you don’t want to create an account in order to do competitor keyword analysis and research keywords from many different sources to create better content and campaigns then you can use Keyword.io. Basically, Keyword.io is a well known free keyword research tool that allows you to find long tail keywords and related keywords absolutely free. There are many amazing features which are available in this tool and one of the noticeable features which you will love here is the list builder. You will find this feature in the latest version of Team Explorer but you need to buy the premium version of this software in order to use it. As soon as you will open the website, you will get a window on your screen asking for free account creation but you can close it away and start using Keyword.io keyword generator. Keyword.io free keyword research tool is the most appropriate Google keyword planner alternative for you to get hundreds of keyword suggestions for FREE! The next tool which you can use for competitor keyword analysis is SEO Book. SEO Book has a keyword analysis tool which can be used for finding profitable keywords from popular search network. For ranking your content on the internet, you must have the knowledge of which keywords you should be targeting to increase your website rankings, traffic, and profit etc. Seo Book keyword suggestion tool helps you in knowing all these important things too. In order to access SEO Book Keyword Tool for generating keywords, you will have to register for a free account. 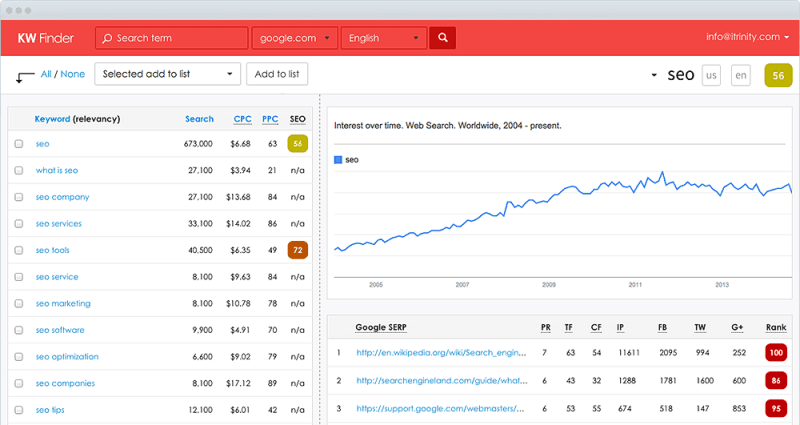 The tool will also show Google trends data graphs along with daily volume in the search results. Bing Keyword research tool is not one of the best alternatives which you can consider for Google Keyword Planner. However, if you are running short of keyword ideas then you can use Bing keyword research tool. All data is from the organic search, up to 6 months of data, keyword ideas by language and country/region, research history etc. are some of the most helpful addition in the Bing Keyword Research tool. In order to use Bing keyword research tool, you need a verified account with Bing and that you can create for free. Bing Keyword research will display both exact and broad matches for the searches which are done. Simply sign up for Bing Webmaster Tools and start getting keyword ideas and suggestions for your content. 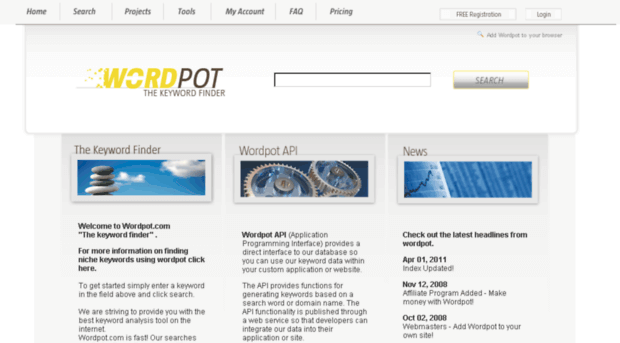 You can use WordPot for free to search keywords which will help you in ranking. If you don’t know much about keyword analysis and are wondering how to do keyword research for SEO, you can have a look at tutorials available in the help section. There is one disadvantage of this tool and that is you are not allowed to do two different projects, so if you are a pro user and want to use a good tool for SEO keyword competition analysis you should look out for other software. Keyword Discovery is another best free alternative to Google keyword planner tool. In order to use Keyword Discovery – Advanced keyword research tool and search term suggestion tool, all you need is a free account. Log in with your free account and you can search keywords for any phrase. There are many features of this tool which can be unlocked by verifying your account either using a phone number or via SMS. It will take around a day for the account verification to take place but once you are verified, you can use all the features of this keyword research tools for free. Keyword discovery limits 50 queries in a month and 10 results for a single query. SERPWoo Keyword Finder is also one of the best free keyword research tools. One of the reasons that SERPWoo Keyword Finder is a valuable keyword research tools is because of its advanced options. Easy to use interface, real-time keyword filters, pull all the top 10 domain’s rankings in a single click, create unlimited lists, ease one-click to start tracking w/CSV, XLS export, and untethered power etc. are some of the most interesting features of SERPWoo’s Keyword Finder – Keyword Research Tool. You can find the keywords as per the different search engines. If you want keywords for your AdWords campaign then also you can use SERPWoo Keyword Finder. You will have to create an account to start accessing this free keyword research tool. Don’t worry, take SERPWoo for an unlimited days test drive because it’s free. SERPS Keyword Tool is also a popular free keyword research and suggestion tool which is almost quite similar to Keyword.io. You can save the list of all the keywords from the keyword analysis you did into a CSV file. 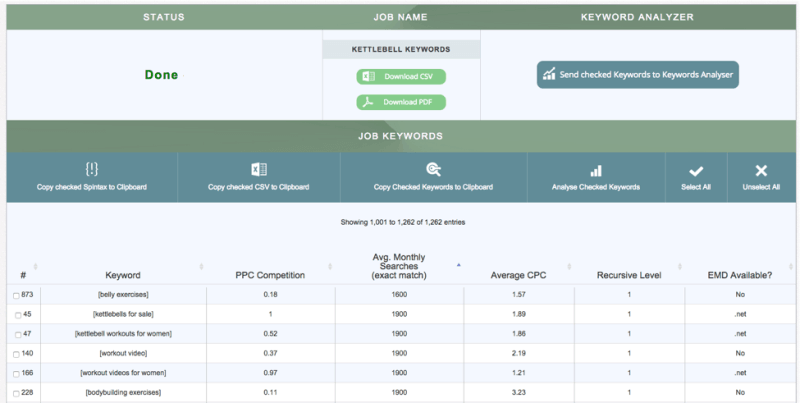 With the help of this free Google keyword research tool, you can easily find long tail high paying AdSense CPC keywords and expensive keywords in Google AdWords advertising for free. 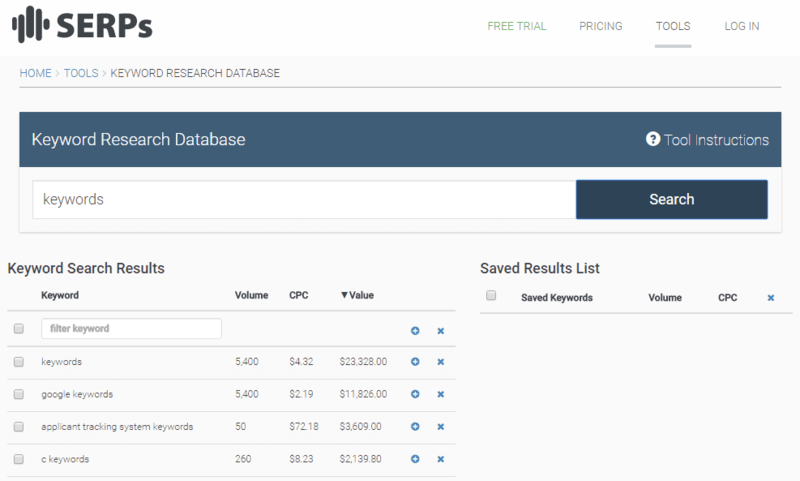 You can use SERPS keyword research database and research keywords to target for SEO, Google PPC and more. There is only one disadvantage of SERPS Keyword Tool and that is there is small search index available and the indexing is limited for free users. In order to unlock more premium features of this tool, you can upgrade to a premium account of this tool. InstaKeywords is also a well known and really helpful Google Keyword Planner alternative. It is a free long tail keyword research tool which offers you hundreds of relevant keyword suggestions with valuable keyword data like specific keyword’s global search volume, local search volume, the total number of searches in last month, Cost per click (CPC), etc. You can use this free long tail keyword tool to generate keyword suggestions and find out unlimited keywords which will help you in the easy ranking of your content on the internet. You can also create free campaigns and save the keywords from that campaign in InstaKeywords. Google Trends is a good platform for searching all the trending keywords. All the topics which are trending on the internet are available on Google Trends. It will help you in getting a basic idea about the keywords which you can use in your articles in order to rank them. Google Trends won’t show you exact keywords but will show you the topics which are trending on Google. Trending searches are the most profitable keywords to drive huge traffic to your Blog or website within a very short period of time. 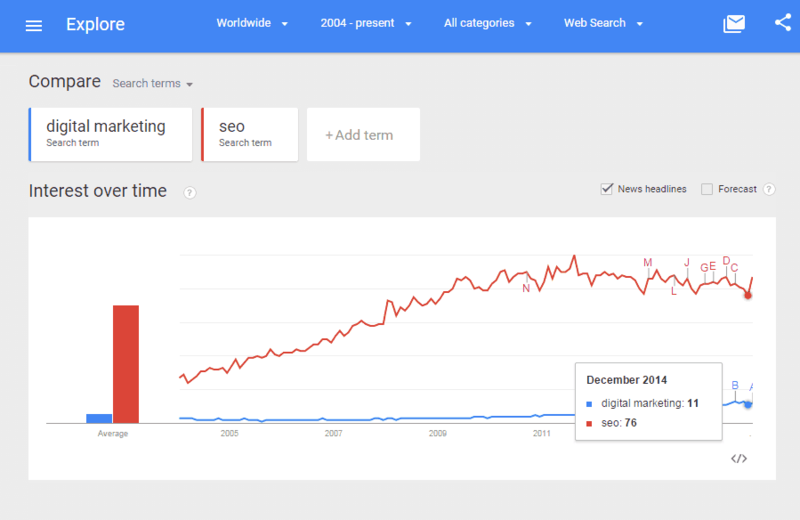 So, you can use Google Trends as a free Google keyword planner tool alternative to get the most trending keywords. We hope you found some really useful free keyword suggestion tools and free Google AdWords keyword planner alternatives for keyword research. If you are having some money to spare and are looking for advanced features in SEO keyword competition analysis tool then you can have look at the premium Google keyword planner alternatives which are available out there. There are many paid alternatives to Google keyword tool available on the web but we made a little list and compiled only the best options where you can put your money at. Are you looking for an easy way to find the best keywords to rank in Google search engine? If yes, you must try out Long Tail Pro keyword research tool. Long Tail Pro is the most popular premium Google keyword planner alternatives and best keyword research tool for long tail keywords. Unlike other keyword research tools which we have listed above, Long Tail Pro is a long tail keyword research software which you need to install on your computer. This premium keyword research tool comes with a lot of advanced features which you won’t get in any keyword research tool. You can opt for a 10-day trial by paying $1 where you will be able to access all the advanced features of this tool. If you want to do deep keyword research, we suggest you go for Long Tail Pro as it is the best alternative for Google Keyword Planner. The next tool which you can use to analyze keywords for search engines is SEMrush. The tool will provide you detailed information about the keywords which you have searched for. Some of the information which you are going to get using SEMrush is search volume, CPC distribution, the number of results and much more. The tool will also provide you related keywords with their search volume data. You can use the tool for free. But in order to access all the functions, you need to sign up for premium plans. In simple words, SEMrush is a powerful service which can be used for competitors research and to find organic and Ads keywords for any site or domain. If you want to discover the most profitable keywords for PPC & SEO then SpyFu Keyword Research Tool is the best choice for you. SpyFu is quite similar to SEMrush in terms of functionality. If you want to use SpuFu services, you don’t need to sign up for an account. You will be able to check cost per click, click-through rate, related keywords using SpyFu. If you are going for the free version of this tool, you will be able to analyze the maximum number of 5 keywords. However, if you go for the premium subscription you can access unlimited keywords. With the help of this amazing keyword research web-based service, you will be able to download your competitor’s most profitable keywords and ads for paid and organic search. It will perfectly help you in increasing your website traffic, tracking your keyword rankings, and making better connections. The next premium tool which you can use for SEO keyword competition analysis is Moz Pro. Moz Pro is a complete set of SEO tools in one package. Moz Pro offers many advanced features and one of these features is weekly tracking of ranked keywords. You can easily track the keywords and find out if you were able to track them or not using Moz Pro. Moz Pro Keyword Explorer allows you to discover the best keywords to target. You can also look out for ranking comparisons and find out where your website stands in around 200 countries. If you want detailed reports of your campaigns, you need to use Ahrefs keywords explorer tool. 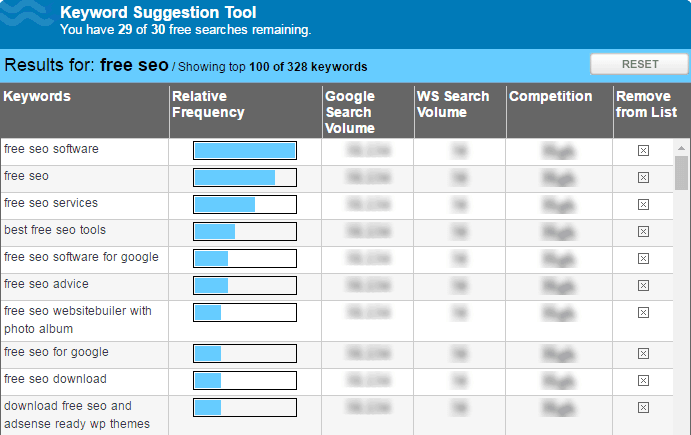 The tool shows organic traffic dashboard and provides keyword ideas along with search volume for all the match types. 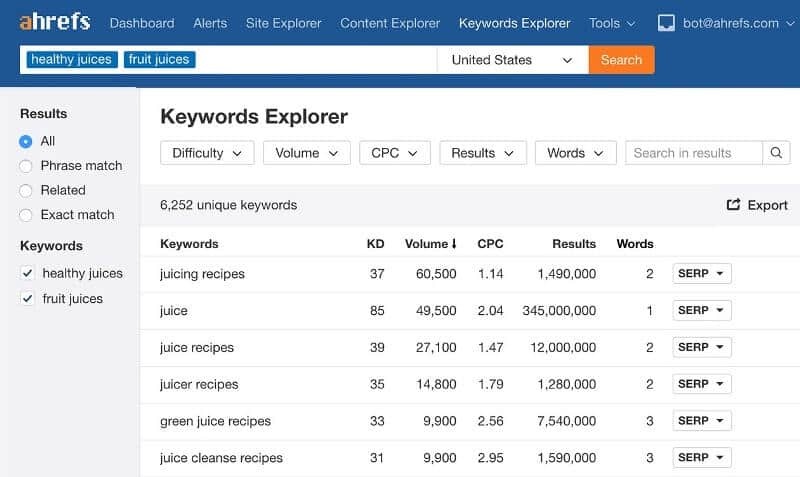 Ahrefs Keywords Explorer is really a great keyword analysis tool to get thousands of keyword suggestions, check keyword difficulty score, and different keyword ideas to rank for. Keywords Explorer – Ahrefs also offers the option to filter out best keyword opportunities. You can filter by the Keyword Difficulty, Monthly search volume, Cost Per Click, Number of search results, and Number of words in a keyword etc. If you want to try all the features which are available in Ahrefs then you can go for free trial available with this tool. In case, you want to get the huge number of Google keyword suggestions for free or find the exact keywords that people are typing into Google Search Box then Keywordtool.io is the best keyword search tool for you. Actually, Keywordtool.io retrieves keyword ideas from multiple sources like Youtube, Google, Amazon, Bing etc and show you the most accurate keyword suggestions. The Keyword tool also allows you to select the suggested keywords from Google TLD, location, language etc. 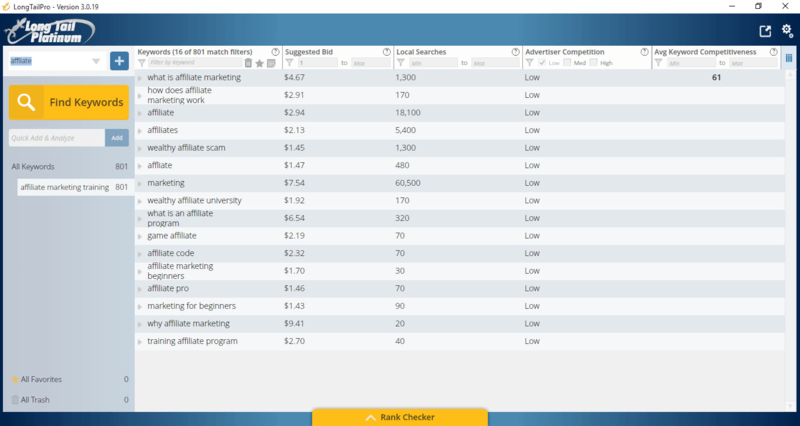 Using the free version of this tool you can access hundreds of suggested keywords. In simple words, Simply it can be said that Keyword tool (keywordtool.io) is the best alternative to Google Keyword Planner and other keyword research tools. Even, this tool also helps you to find keywords that are hidden in Google Keyword Planner tool. Term Explorer is a complete suite which allows you to search for keywords and rank them. Using the tool you will be able to find the most profitable keywords and use in your content. Using your Term Explorer free account you can do 5 keyword searches after which you will be forced to sign up. Users will be provided with relevant metrics like search volume, the average cost per click, average monthly searches, difficulty index and much more. More keyword data than any other tool, Automated keyword discovery engine, Easy And Powerful In-App Filtering, SERP-Level Data For All Page 1 Results, Link Volume And Link Strength, Automatic Exact Match Domain Search, Easily Export All Data To CSV, Unlimited Keyword, and Analyzer Report History, and Brandable White Label Reporting etc. These are some most important features which make Term Explorer tool more valuable. KWFinder is a very well-known keyword finder and SEO difficulty tool which helps you to find long tail keywords with low SEO competition. Using this keyword research tool, you can search for keywords from five different countries. If you are targeting multiple countries and want to find hundreds of hidden keywords with low SEO difficulty in seconds then you must use KWFinder. This keyword suggestion tool will also provide you a keyword difficulty score along with keyword ideas which are sub-divided into multiple metrics. The paid version allows you to do unlimited searches. However, if you are going for the free version you will get limited searches only. If you want to focus on your campaigns then we suggest you go with KWFinder. Wordtracker is a quite old keyword tool which helps you in managing your SEO campaigns and doing keyword research. 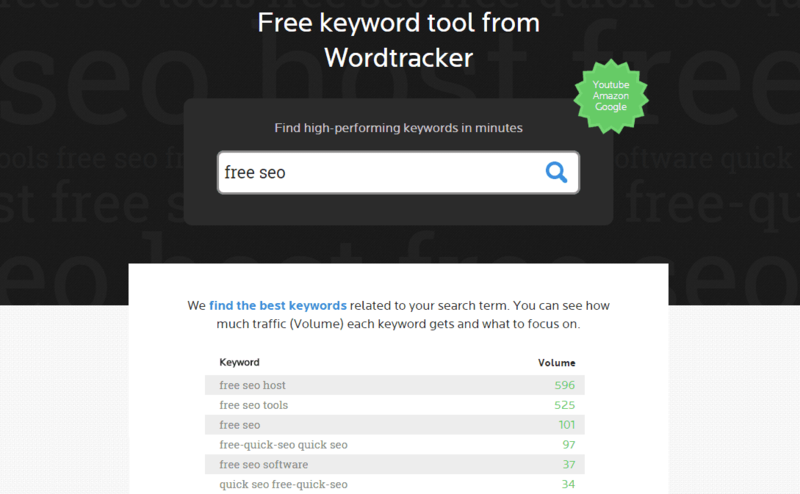 Using the free service of Wordtracker, you will be able to find the top 100 results which are available for that particular keyword, but you won’t get free version anymore as it is converted to the trial version. You will be asked to enter your credit card details when you sign up for the free trial and once your trial expires your trial account will be converted to a premium account. If you are also one of those users who want to find high-performing keywords in minutes then free keyword tool from Wordtracker is a great option for you. WordStream’s Free Keyword Tool lets you manage your pay per click campaigns, do keyword research and much more. There are both the free version and premium version of this amazing keyword suggestion tool. You will get the basic features in the free version of this tool and the number of searches which you are going to get here is going to be limited. With the free plan, you will get related keywords. However, if you are going for the premium plans you can also get the search volumes which are available for that particular keyword. For a good SEO campaign, you need to use some best and most profitable keywords. A detailed keyword research for search engine optimization will perfectly help you in getting the content present on your website ranked on all the major search engines. Undoubtedly, Google Keyword Planner tool is the best keyword research tool and free AdWords tool on the internet which you can get as of now. However, if you are not happy with this Google AdWords keyword planner or Google keyword tool then you can use any of the above mentioned free and paid google keyword planner alternatives. We hope this Google keyword search and Google keyword tool guide will help you in finding the best Keywords for your upcoming articles. Let us know using the comments section below – Which free alternative to Google keyword planner or keyword research tool are you using to do keyword research for SEO (search engine optimization)? Great Post. You should also add SmartSERP.com to the list. It is one of the most powerful Keyword research tools in the market.